When it comes to visiting San Francisco, expenses can pile up pretty quickly; after all, San Francisco is one of the most expensive cities in America. As a result, learning to travel to the Bay area on a budget is an essential part of planning your trip to California this year. As with most tourist meccas, San Francisco offers plenty of easy ways to pay big money for things that won't really enhance your experience. Instead, you should be on the lookout for free and cheap events, activities, and attractions in the city—including many of the landmarks and tourist attractions that make San Francisco famous. No matter what time of year you visit San Francisco, though, you'll want to remember to bring a light sweater as nights are often chilly and foggy in the Bay area—especially if you're staying in the Richmond or Sunset districts. Even in the middle of summer, the microclimates of San Francisco can make it feel like autumn or winter. Many first-timers misjudge the climactic challenges—one of eight common mistakes made by San Francisco visitors. San Francisco offers quite a few budget menus and moderately priced eateries to its visitors, including many of the "Top 100 Restaurants" featured on SFGate. About 20 of those selections are budget-oriented eateries. Chinese food is also very good in the city and tends to be less expensive than other choices. When it comes to cheap accommodations, San Francisco has long been a city that's attracted younger visitors and has a robust network of hostels out-of-state guests can use for much cheaper than hotels. Beds typically cost $25 to $35 per night and sometimes include breakfast. If you seek a hotel room, there are also great budget properties where you can quickly find convenient connections to mass transit and area attractions. The Argonaut Hotel at Fisherman's Wharf frequently is too costly for a budget visit, but they bundle travel products and sometimes offer lower rates than you might expect for such a prime location. Additionally, Airbnb offers some accommodation in the city, but sometimes provides a wider variety of choices outside of San Francisco in places like Sausalito in Marin County to the north, or Berkeley, home of the University of California. Both of these places are also fine locations for some on-foot exploration if you need a break from the city. When it comes to getting around the Bay Area—especially when you're arriving from San Fransico International Airport (SFO)—cabs and even ride-sharing services can get rather expensive rather quickly. Fortunately, San Francisco has a pretty great transit system known as the Bay Area Rapid Transit (BART) which connects everything from Sausalito to San Jose through a series of trains and bus routes. Tickets on the BART act like debit cards and fares are based on distance traveled, which means that BART does not sell all-day or unlimited travel passes like you might find in other cities like New York or Philadelphia. However, you can often find discounts, including those for people with disabilities, seniors, and children aged 5 to 12. You can plan your travel and budget for the cost with an online calculator. BART provides service to both San Francisco (SFO) and Oakland (OAK) airports. San Francisco Walking Tours provides free guides for exploring more than 70 areas of the city. Although free, it is advised that you tip your guide at the end of the tour and help support this non-profit organization. 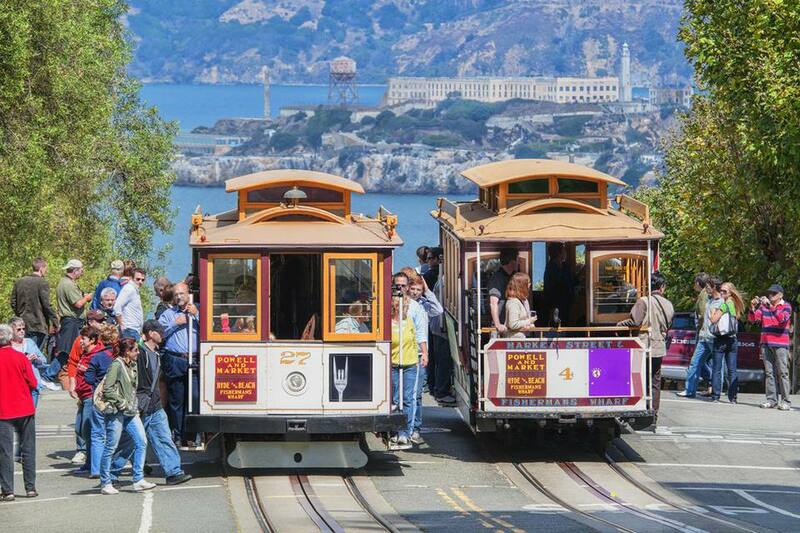 Additionally, purchasing a City Pass allows admissions, cable car rides, and bay cruises for a lower cost than paying for these attractions separately. The former island prison known as Alcatraz is the single most popular attraction for tourists in San Francisco. There is no admission fee (Alcatraz is operated by the National Park Service) but getting to the island involves buying a ferry ticket. The Union Square and Fisherman's Wharf areas are also visitor favorites, where you can shop carefully for Alcatraz excursions: There are a variety of companies that offer this tour, and many will combine it with Muir Woods, Angel Island, or any number of other places at a variety of prices. Muir Woods National Monument just north of the city features a stand of coastal redwood trees. Admission is free for those under 16 years of age and modest for everyone else. Further north, the Napa and Sonoma valleys are renowned for their wine industries. To the south of the bay, Monterrey and Carmel-by-the-Sea offer scenic coastal views such as the 17-mile drive. Further afield, you can visit Yosemite National Park in less than a day's drive, but it's probably better to stop there on your way in or out of the Bay Area as day trips from San Francisco can often be rushed and expensive. If it's your first visit to the Bay, you won't want to miss taking a ride on a cable car, which offers a unique experience that's vintage SF and relatively inexpensive. Tickets can be purchased on board or at street kiosks. To avoid long waits in the summer, try the California St. line, which runs east-west from Market and California to Van Ness Ave. The best view of San Francisco could be at Twin Peaks: From 17th and Clayton Streets, go south on Clayton and then veer to the right at Twin Peaks Blvd. You can also pick up northbound Twin Peaks from Portola Drive. Follow it upward and you'll get a sweeping view when not obscured by fog. Additionally, a walk across the Golden Gate Bridge is entirely free of charge, and only a dense fog can spoil the magnificent views from the deck of this engineering masterpiece. Many people drive across the bridge without being able to savor the views, but if you board buses #28 or #29, either of which stops right at the bridge toll plaza, you can easily explore this attraction on foot. If you'll be spending several days here, consider the purchase of a Go San Francisco Card. This is a card you buy prior to your trip and then activate on first use. You can buy from one- to five-day cards good for free admission at dozens of local attractions. Design your itinerary before you consider a Go San Francisco purchase to determine if the investment will save you money on admissions. There are also two ways to buy discount theater tickets: Through TheatreBayArea you can order discounted seats online for a variety of shows or by visiting the Union Square office. Some shows are only available online while others are only available at Union Square. Some can be bought either place. Additionally, Discovery Kingdom is popular with families visiting the Bay Area. To save money, print tickets or passes for the Six Flags park near Vallejo before you leave home.